← This Calls for a Celebration! One of Babbitt’s best latter-day scenes is from the feature film, Raggedy Ann and Andy: A Musical Adventure (1977), directed by Richard Williams. For 1970s animators and kids of the 1970s/early 1980s, the film is still appreciated; for almost everyone else, it’s unfortunately forgotten. 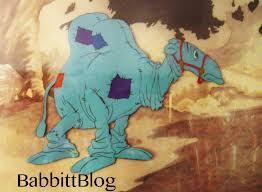 Babbitt tackled the Camel With Wrinkled Knees as being three characters in one, each acting independently: the front half, the back half, and the head. Babbitt used film reference of himself bobbing across the park (filmed by his wife Barbara) for these different character sections. If you watch the animated clip, you can almost imagine two uncoordinated bumblers moving independently in a single Camel costume. This entry was posted in 1946-1970s: Later Years, Animation, Film and tagged Raggedy Ann & Andy, Richard Williams. Bookmark the permalink.